Waxtopia: Upper Deck Evolution or Darwinism at it's Worst? Upper Deck Evolution or Darwinism at it's Worst? After a 15 year hiatus from the hobby, my first box of cards I busted was a hobby box of 2009 Upper Deck Football I got for my birthday. I loved everything about it. Great player selection, hard to find SP rookies, and 3 fun hits. (Mendenhall auto!) I liked it so much in fact, I decided to pursue collecting the entire base set. (Still need several SP rookies) And at about $3-$4/pack, 20 cards felt like a bargain. Sadly, none of those things can be said about 2011 Upper Deck Football. The checklist has been greatly reduced (50 base cards, 200 star rookies) due to a lack of an NFL license. Only draft picks and retirees will be found here. This immediately changes the collectibility factor for set builders. The product has also gone from 20 cards/pack to 6 cards, and only 1 guaranteed hit per box now. While there is no official MSRP, I found it at my LCS going for $5/pack. All of the above factors are enough to possibly deter buyers, but that's not the worst part. Anyone who has been paying attention in the collecting world for the last couple weeks has seen all the hype about the war between Upper Deck and Panini to make the "world's first video card". Well UD has technically won the battle, but it looks to be a hollow victory. 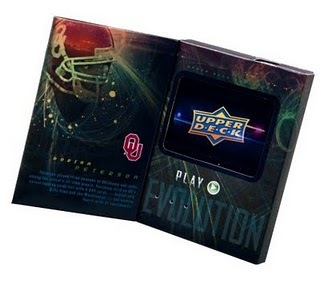 Upper Deck has named it's video card creation "Evolution" and has been centering most of the hype of 2011 Football around this new insert. After watching a box break of this on Beckett's web site however, I am underwhelmed. The first problem created is that the video card isn't found in normal packs, it is treated like a box topper, only at the bottom of the box. If you think that is a deterrent, tell that to the LCS guy in my neighborhood who looked under all the packs and then returned it to the counter to sell single packs. He also informed me that they are treating the Evolution cards as box toppers and customers won't get a chance at them. Is this what Upper Deck had in mind for their new "Diamond Dealers" program? The most embarrassing thing came at the end of the break though, when they opened the card and the battery was completely dead. Once they finally got it charged up with a mini-usb cable (not included), we saw a mostly forgettable highlight montage of DeSean Jackson. I am all for industry innovation but the execution has to be better than this. If the cards were autographed(like the ones Panini promises are coming), then they would be sure to hold at least some value for years to come. Sadly, this product has rushed written all over it and you have to wonder if this was a race against the clock to beat Panini to the punch. The one redeeming quality of this release is the photography is still top notch. Some of the retiree's cards are in black & white, and the dramatic result is a success. Unfortunately that is not enough to overcome a weak checklist combined with less hits and increased prices. ($100/box at my LCS) The ultimate question here is, with those prices and such few hits, who is most likely to buy this product? My guess is not very many.